cases reported for the same period last year. pared to the cases notified in EY '65-'66 and EY '64-'6(5. \ear total is the lo Pest one on record. ported to the NCDC during this period. of the outbreak the disease was felt to be an intoxication. this outbreak resulted from pentachlorophenol poisoning. agent in the final laundry rinse. the infants' clothing and brows were drenched with sweat. tion of the lungs was normal and cyanosis was absent. megaly. and irritability followed by lethargy. Anorexia. irritation of the skin were not seen. the renal tubules of one case. case, were transferred to other hospitals for treatment. two fatal cases, recovery was apparently complete. these eight cases, at onset of illness, was 8.9 days. for 2 years within the hospital, but never in the nursery. that came in contact with infants' skin. was thought to be the toxic chemical causing the disease. a milder form of the same syndrome. be used" in laundering diapers. the laundry was actually using 3 to 4 ounces. in freshly laundered diapers obtained from the nursery. remained for these more sophisticated analyses. nesses that might be caused by the misuse of this product. establishment that is involved in general laundry work. (Reported by J. Earl Smith, ll.D., Health Commissioner. 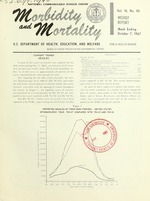 Division of Health, Department of Health and Hospitals. ist. Clinical Laboratories. St. Louis. llissouri: E. A.
Belden, M.D.. Consultant, Communicable Disease Control. infectious, cause of this outbreak. The fever, sweating. hospital linens, nevertheless, was in use in this hospital. duct is not in use. phenate as a molluscicide. Bull I\HN 25:597-601, 1961.
went to Cranbrook with their boys or to bring them home. onset dates were 7 days after arrival (Figure 2). these children were confirmed as typhoid fever. over the liver. On September 15, rose spots were observed. from ampicillin and IV fluids. vomiting, diarrhea, fever, and headache on August 22.
after 5 days; diarrhea, malaise, and anorexia persisted. major plumbing repair at this resort on August 7. 1967.
persons living within a 15-mile radius of the area. negative. Viral studie- to date ha\e been negative. gastroenteritis at a New Jersey State School for Girls. the following day. Hours of onset are shown in Figure 2.
other meals were not unusual. * The ill group includes only those persons who became ill on Wednesday. or stool specimens were submitted by six ill persons. are available on the tests for enterotoxin in the food items. *LUNCH SERVED FROM 11.50AM TO 1230PM. and methods of handling and storing perishable foods. cephalitis (EEE) have been reported from New Jersey. separated by a distance of approximately 10 miles. South Carolina........... 65 78 566 616 through previous months. South Carolina.......... 61 65 627 681 through previous months.